Acquiring a gun, picking up a knife, or getting into a car requires hardly any planning. Islamist low-tech terrorism was first advocated seriously in 2010. Al-Qaeda in Yemen (led by the late American Islamist, Anwar Al-Awlaki) encouraged Muslims to get in their pick-up trucks, which they referred to as "Ultimate Mowing Machines," and "mow down the enemies of Allah." 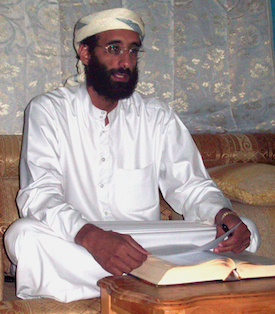 The late Islamist leader Anwar al-Awlaki, 1971-2011. Then, in 2014, ISIS called on Western Muslims to use vehicles, knives – anything to hand: "If you are not able to find an I.E.D. or a bullet, then single out the disbelieving American, Frenchman, or any of their allies. Smash his head with a rock, or slaughter him with a knife, or run him over with your car, or throw him down from a high place, or choke him, or poison him." Cheurfi was born in France, and had a long criminal record. From 2001, he was imprisoned for 11 years after shooting at two police officers from a stolen car. 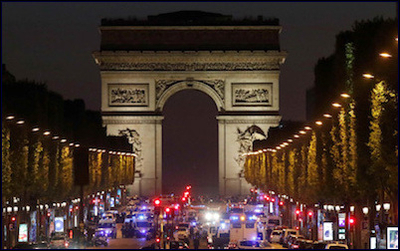 He was not identified as a possible Islamist until December 2016, according to Le Monde, after police were warned that he was planning an attack. In February, he repeated the threats on a messaging app, and was questioned by police. Then, in March, he attempted to contact ISIS fighters in Syria. By that point, he had been included on a list of 16,000 Islamists the security services deemed potential violent extremists. Europe faces an onslaught. France, in particular, has far more potential terrorists than security service resources to stop them. Along with more effective counter-terrorism work, the only possible long-term solution for Europe, is to actively stamp out all violent and non-violent Islamist influence, and back reformist Muslims instead. Europe's radicalization problem has been severely exacerbated by government attitudes towards Muslim communities. Over the past few decades, Europe's radicalization problem has been severely exacerbated by the attitudes of government towards their Muslim communities. European state multiculturalism policy regards its citizens not as individuals, but as blocs — or communities — delineated by ethnicity, race and religion. In order to interact with these communities, governments need intermediaries to manage them. Among European Muslims, where there is no organized clergy, only the Islamists have had the wherewithal to proclaim themselves representatives of the dozens of different, fractious political and religious Islamic sects. To run the communities, governments have handed these Islamist leadership groups taxpayers' money, political power, and influence over schools, hospitals, prisons, chaplaincy programs, among other things. Consequently, an entire generation of European Muslims have grown up attending Islamist-run mosques, schools and community centers. Islamist politicians are elected to government offices, Muslim prisoners are placed in the care of Islamist chaplains, and Islamist charities move money to and from the Middle East – much of it partly subsidized by European taxpayers. In strictly secular France, its multiculturalism policy funds ethnic groups rather than religious ones. But because the clear majority of French Muslims are from North Africa, taxpayer subsidy of these communities ends up being claimed by the Islamists as well. For Karim Cheurfi, radicalization was not necessarily the result of slick propaganda videos produced by Islamic State, or a particularly convincing contact on social media. His introduction to Islamism was offline – it occurred simply by virtue of the fact he was a European Muslim, surrounded and politically represented by a community under the thumb of Islamist ideologues. For Europe to survive, the Islamists must be squashed. Funding must be cut off, both from Western governments and foreign Islamist regimes. Extremist mosques must be shut down, extremist foreign clerics should be deported, and moderate, anti-Islamist Muslims must be funded and supported. Most importantly, Western Europe must stop organizing its Muslim citizens into homogenous religious and ethnic blocs, ripe for radicalization.